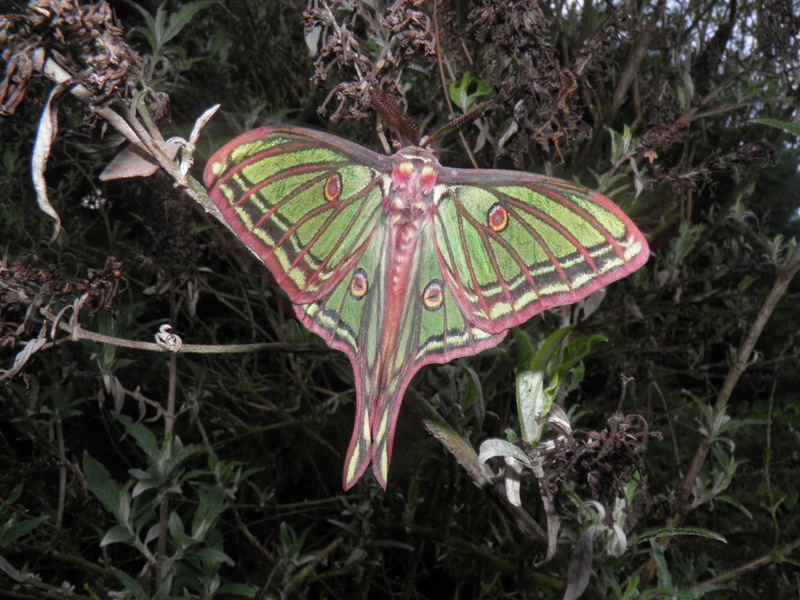 Graellsia isabellae — “Spanish moon moth” | Welcome, visitor! Graellsia isabellae, the Spanish moon moth, also known as the Stained glass moth, is a moon moth species endemic to France and Spain, and is often considered to the be most beautiful moth species found in Europe. It is one of the few moth species that enjoys a protected status. Graellsia isabellae is a species that inhabits mountains; in fact it is only found high in the Alps and Pyrenees, where the larvae feed exclusively on pine trees. 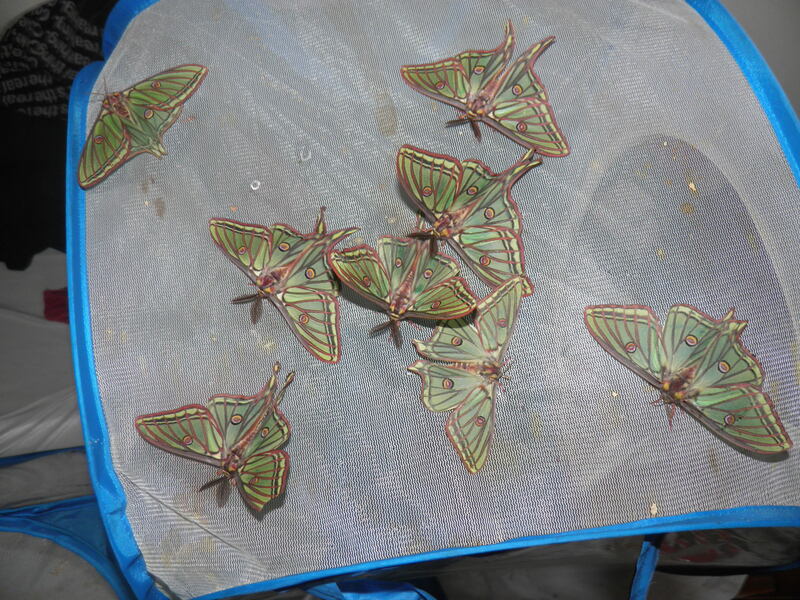 Adult moths are found from April to July depending on their habitat; the species is fragmented into several isolated populations in the mountains that do not come into contact with eachother, and the flight time of each population may have minimal variation depending on the local climate. Interestingly, the moths have been reported in Switzerland since recent times – they are not native to Switzerland, and this is thought to be an introduction by humans. Evidence suggests that the population in Switzerland in fact shares multiple traits by the moths found in Spain and France (and is thus a ‘hybrid’ of individuals originating from several populations and countries) supporting the fact they were established from moths taken from other locations where they are native. Several subspecies have been described. However, there is great doubt that any of these subspecies are actually valid subspecies at all. You see, it’s true that this moth species has been fragmented into several isolated populations that do not come into contact with eachother, and that each of them, may have their own unique traits. But that does not automatically make them subspecies; in fact, no significant biological differences can be found between all the subspecies of Graellsia isabellae at all! Populations, when isolated from eachother, do have a habit of diverging and developing their own traits; but the differences in Graellsia isabellae are absolutely minimal, ranging from reportedly being “bigger” or more “strongly marked” (ssp. ceballosi) or even country of origin (ssp. galliaegloria) and a slight “curvature of the hindwings”. These differences can simply be seen as variation. There are no subspecies of Graellsia isabellae. They are different populations with minimal differences in them, in which there are a lot of intergrades and overlap. The minimal appearances in appearance of these populations may also be due to the local enviroment; factors such as temperature, humidity, light exposure and other things can affect the appearance of moths. If not, they are likely just the effect of genetic divergence of populations. However, their morphology and ecology show no significant differences at all. The moth can be legally bred and collected by hobbyists; although many of their populations are now protected, and the moths are protected in some countries in Europe too, the population in Switzerland appears to be the legal loophole. For the moths are thought to be introduced here by humans, they do not belong here and are thus not protected here. This is perhaps for the best: due to the high demand of cocoons and specimens of this moth for breeding and collection purposes, the legally collected material from Switzerland will reduce the demand and pressure from the native populations (although it must be said that collecting adults makes no impact on wild population at all). Graellsia isabellae is a primitive species – in fact it is regarded as a “relict species”. It is thought to be a relic originating from the ice age or beyond. It is thought that their habitat is a refuge location. This means that for the past few millions of years, while the climate of Europe has drastically changed, the conditions in the small areas in the Alps and Pyrenees have remained stable, and never changed, allowing the small remnant populations of this moth to survive for thousands of years in these small habitats. 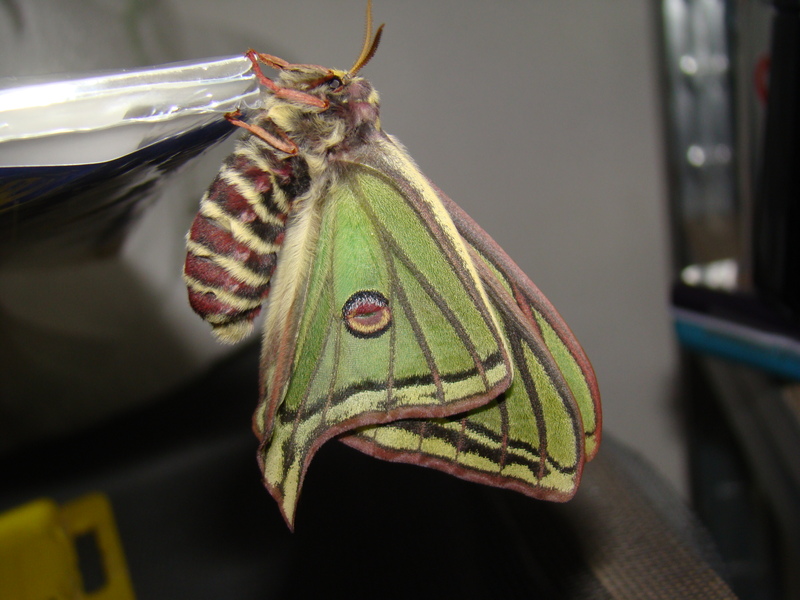 Graellsia isabellae is a split off from the ancestral lineage that evolved into the modern day “Actias” moon moth species. In fact, the the ancestor of all moon moths have at one point split into the comet moths (Argema) and moon moths (Actias and Graellsia), and Graellsia isabellae is definitely allied to moon moths (Actias), and definitely not comet moths (Argema). This is evident by how succesfully they are able to hybridise with Actias species in captivity; they are quite compatible. Graellsia isabellae is simply a ‘cousin’ of what was the ancestors of all moon moths in genus Actias. 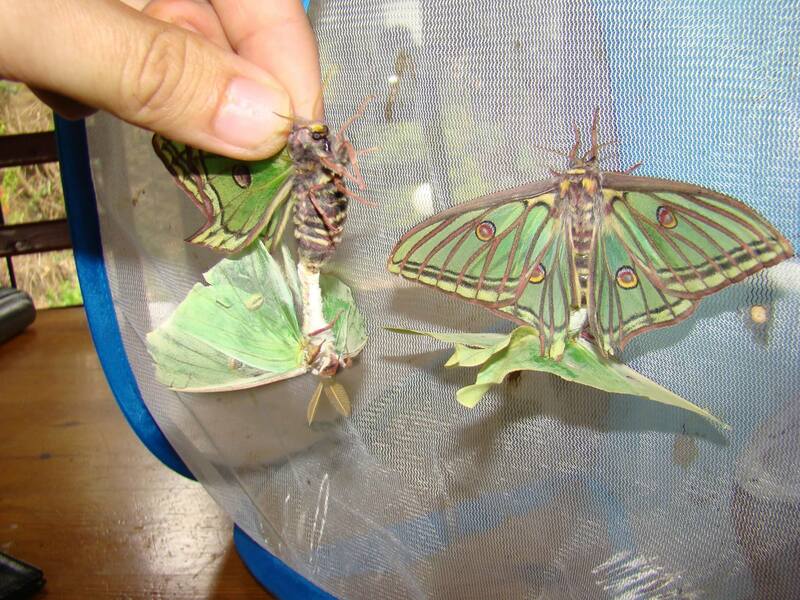 Graellsia isabellae that are freshly emerged; ready to be seperated in cages (usually one pair per age) to pair them. Graellsia isabellae is a pine feeder, and in the wild they only feed on black pine (Pinus nigra) and Scots pine (Pinus sylvestris). They feed on nothing else, although they can accept many different kinds of pine tree in captivity (Pinus sp.). The habitat of Graellsia isabellae are dry, mountainous pine forests in the Alps and Pyrenees. In summer, these places can heat up and become relatively hot (between 20-30 degrees Celcius), combined with colder nights due to a mountainous environment. In winter, the habitat becomes cold, and frost and snow is common. Thus, while cocoons can stand harsh cold and the adults can fly in cooler nights, the larvae need to enjoy a warm and dry environment (as the moths emerge in spring, larvae grow in summer and cocoons overwinter). Special notes: Keep the caterpillars on the warm and dry side and if possible, stress free. The biggest problem with this species in captivity are moths that have no interest in pairing. This could be because of inbreeding (inbred moths typically have no interest in pairing with their siblings, since their pheromones are similar) and because of low vitality of captive livestock because they are reared in suboptimal conditions. Wild stock is the best, but even those individuals can be hard to pair. 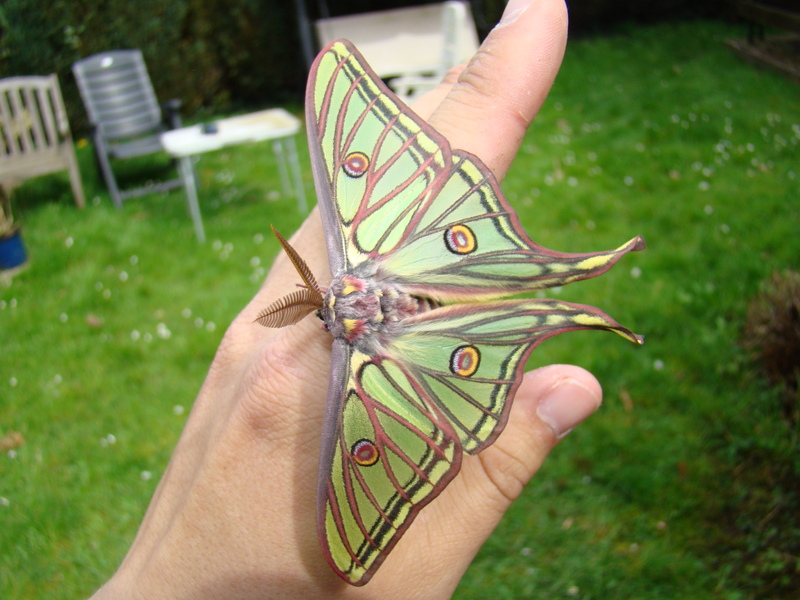 Graellsia isabellae, the Spanish moon moth, is a moth that has a few specific ecological requirements. However, if you can cater to them, you will be able to raise them with no problems. As you may have been able to read in the introduction, the moth is first and foremost a pine feeders (genus Pinus). In the wild, it mainly feeds on Pinus sylvestris and Pinus nigra and rarely on anything else. However, it is “open minded” and will eat many other members of the genus Pinus, such as Pinus strobus and more. Though not optimal, it may accept fir or spruce such as Pseudotsuga, Tsuga, or Picea, but I can not add these to my recommendations as a reliable host plants. Interestingly, there seem to be numerous species of moon moth that specialise themselves in feeding on coniferuous trees in mountainous habitats (on Pinus in particular). Such as the Chinese moon moth (A. dubernardi), Taiwanese moon moth (A. neidhoeferi, that feeds on Tsuga) and Vietnamese moon moth (Actias chapae). All of them generally seem to have comparable ecological niche’s, and so does Graellsia isabellae. If you have been able to breed one of those species before, you will have no problems rearing Graellsia. There is one main difference between those species and Graellsia isabellae; G. isabelle wants to be absolutely dry. However, most (but not all) moon moth seem to inhabit the cooler and humid “cloud forests” of the world where mist and precipation is common. Those who are familiar with breeding pine or coniferous tree feeding moon moths, usually make the mistake of keeping Graellsia isabellae too wet. During summer, the habitat of Graellsia isabellae is dry and hot during the day, followed by cool nights. If you plan to rear the caterpillars, be sure to keep them dry and well ventilated. The first instars can be reared in plastic boxes, and the final instars (L3-L5) can be caged or sleeved. 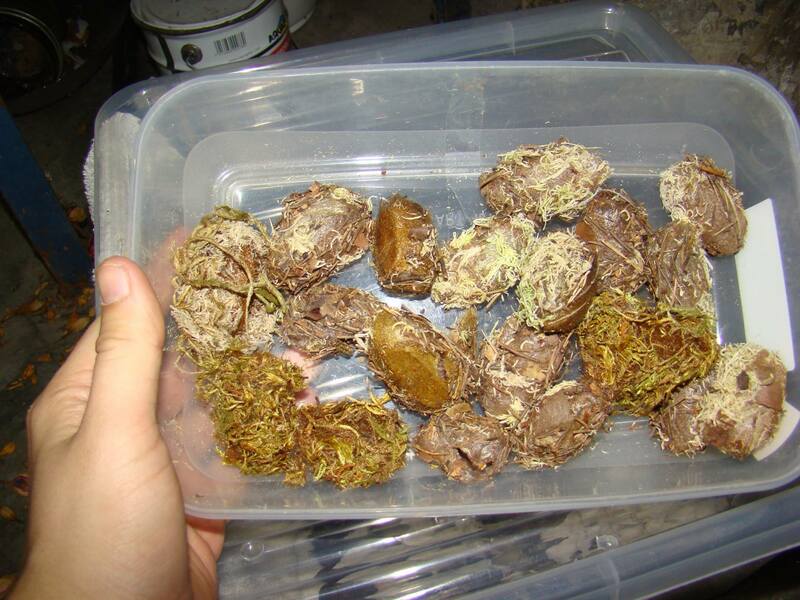 If provided a lot of individual space however, they can also be reared in plastic boxes from egg to cocoon. Eggs hatch in 10 to 15 days time. 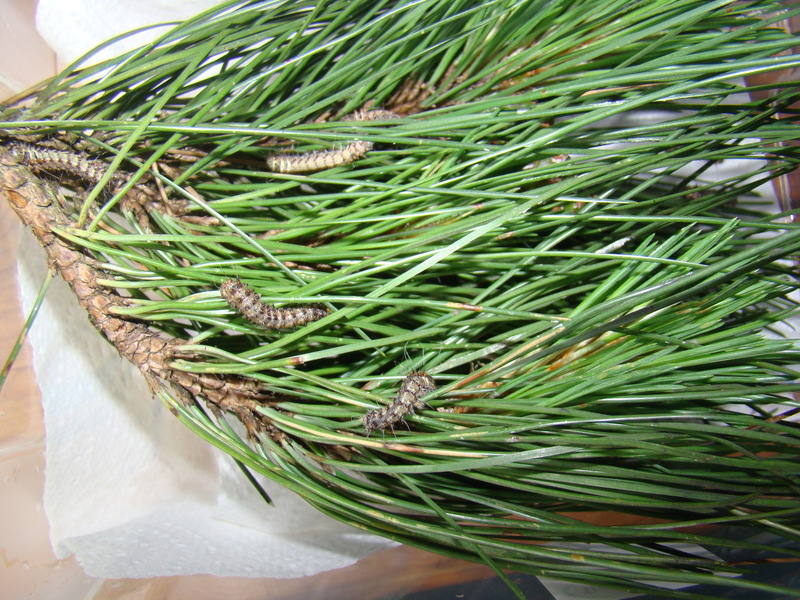 Hatchlings should be relocated to plastic boxes containing cuttings of pine tree. Since pine tree stays fresh for a long time, it can be replaced every 3 to 5 days, but it is important to keep their container clean and prevent mould and feces from piling up. You can rear them in plastic containers from L1 to L5, if kept absolutely dry! However, it recommended rear them in a sleeve outside or in a box with the lid replaced with netting/gauze. If you decide to sleeve them, pick a sheltered spot. These larvae can cope with lower temperatures, but not with excess humidity; too many days of rainfall will infect and kill them. The caterpillars like to be stress free! For that reason alone they should not be overcrowded, and perhaps be reared in low density. It is a fact that Graellsia isabellae reared in high density produce smaller and weaker adults, even if plenty of food is provided. This is due to the caterpillars constantly running into eachother and disturbing eachother. It seems that larvae of G. isabellae do not cope too well with stress. Handling and the amount of larvae per container should be kept to a minimum; this will be benificial to the size of the adults, mortality rate and number of eggs laid. 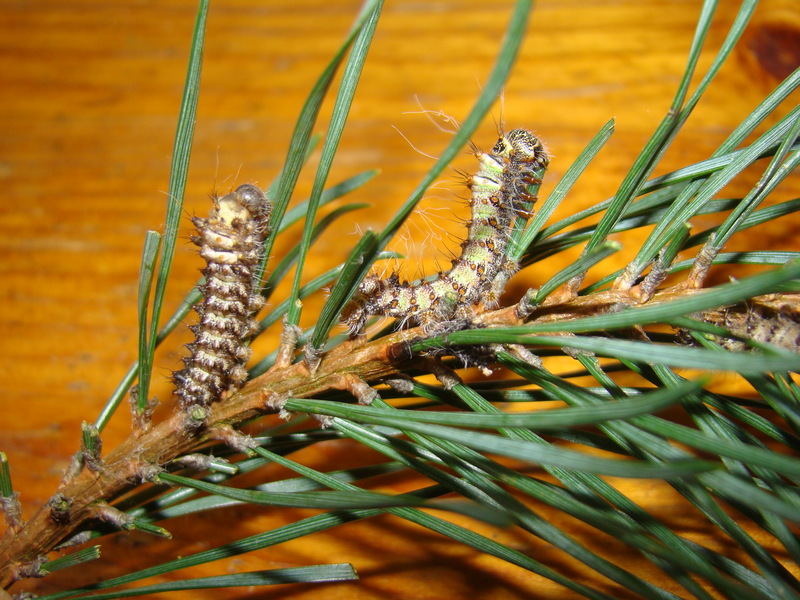 After feeding for about 1 to 2 months time (depending on temperature), the larvae will stop feeding and look for a place to spin their cocoons. Fully grown larvae are bright and lime green, with a dark brown stripe running along their backs, and white/brown patches on their sides. This is a pattern seen in many pine feeders and seems to provide optimal camouflage; for example the pine feeding Sphinx pinastri, Lapara coniferarum and others come to mine, that have nearly the same kind of pattern. Fully grown caterpillar of Graellsia isabellae. Final instar larva of Graellsia isabellae! 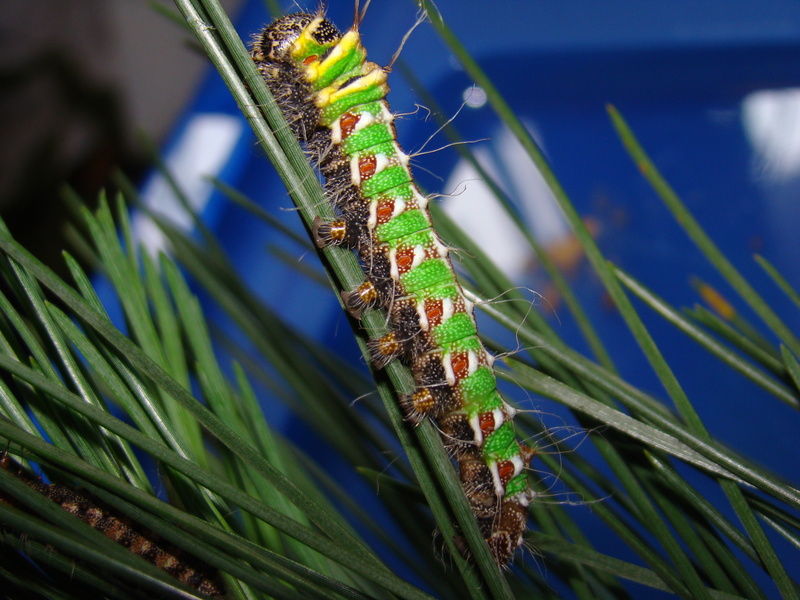 After going through five instars, fully grown larvae will spin a cocoon, which will emerge the next year. It must be kept cold during the winter. For spinning, they can be offered moss or other substrate, which they will readily use. Graellsia isabellae cocoons; all reared from egg to cocoon, overwintering in my basement in a plastic box. The cocoons of Graellsia isabellae should be stored cold, and dry. One should not worry too much about frost. They are from higher altitudes in the mountains (1500m-2000m) where it in the winter, it can become -10C to -20C. They can be overwintered outside in the garden in most temperate palearctic regions; in fact it is easier to store them too warm than too cold. They have one generation a year only and cocoons should take a year to hatch (in spring). When warmed up after being stored cold for several months, the moths start to develop inside their pupae. A cellar, wine-cellar, garden shed or a box outdoors in a cold winter will be sufficient to overwinter them. Fridges are less succesful but it is possible; however do mind that fridges have humidity issues and can dessicate and kill cocoons. One of the problems seen in captivity with this species are “apathic” males; they are the helpless kind of males that are not interested in finding the females at all. Pairings can be difficult to archieve, and in captivity a part of the males seem disinterested in pairing altogether, atleast from my observation, or somehow failed to locate the females. I can only speculate about the reason; some proposed causes are inbreeding, weakened vitality due to improper overwintering, lack of ventilation or pheromone overload, among other possible reasons. The facts remains that in some cases, it can be very frustrating when none at all decide to pair with eachother at all. Graellsia isabellae are receptive towards members of genus Actias, and are sometimes used to make interesting hybrids. They are very easy to handpair with other members of genus Actias. Although I myself am not very occupied with making hybrids and often breed pure species instead of hybrids, this is interesting because it demonstrates their alliance with genus Actias. It is often done out of scientific or entomological interest, but also because dead specimens of hybrids this moth are particulary valuable; collectors are often willing to offer high prices for them. 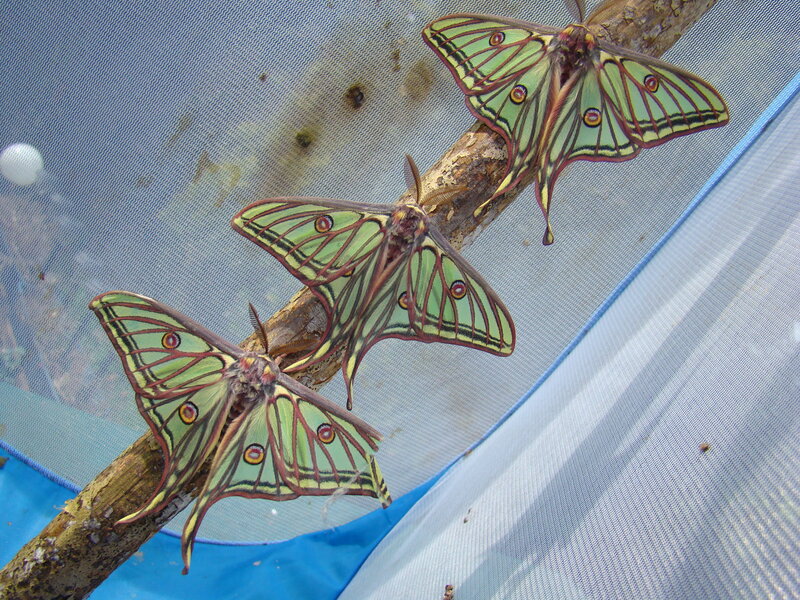 Actias luna males that I have handpaired with Graellsia isabellae females; as you can see they are eager to pair!